Anyway, check out these cute stamps from the U.S. 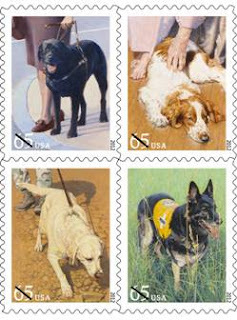 Postal Service which celebrate "Dogs at Work," and are good for sticking on First-Class Mail (up to 2-ounces) and "square greeting cards subject to additional postage because of their shape." Each design was created by John M. Thompson, who painted each of the subjects based off of photographs he had taken. Our favorite has to be the Welsh springer spaniel therapy dog as we recently passed our Delta Society certification exam! While we're not stamp collectors, we definitely might ask for these next time we have to post something. Swing by your local Post Office to purchase, or visit the USPS site/store for more info. These actually look very cool. I'd think about getting them even if I'm not an avid stamp collector or anything like that. How could I have missed this blog! Its incredible. Your style is flawless, like you know exactly what to do to do make individuals flock to your page! I also like the perspective you brought to this subject. You're so cute Paddy! And gorgeous too!